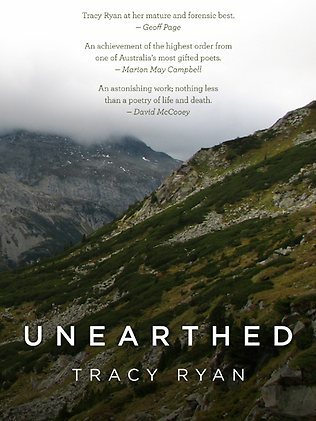 Margaret Atwood once said, “A divorce is like an amputation; you survive, but there’s less of you.” I’ve always imagined this to be true, but my friend Tracy Ryan’s collection of poetry, Unearthed, depicts divorce not as an amputation but a haunting. In the first section of the collection, “Karlsruhe”, a series of connected poems follow a narrative of remembering. After fighting vivid dreams for two years, the narrator looks up her former husband only to discover he died two years ago. ‘You came like news on ships in former times / or like the stars’ far light, already out.’ (We know instantly when the famous die; but it is the unfamous people we were once close to who stop existing without us knowing, and that is a difficult thing.) The haunting, of course, is intensified. A highlight to the book is the breadth of allusion and the appreciation of unusual words, an education for the reader worn lightly; I have learned new words like ‘aestivation’ (an animal’s state of dormancy) which illuminate love and loss in new ways. Then there are the memories around objects, something which has always fascinated me. In “Offertory”, there are ‘tomb objects’ which have survived the late lover, a hole-punch, a blue stapler, which are ‘small unexploded ordnance’. In “The Pawned Wedding Ring”, the narrator contemplates the fate of the eponymous ring, its history since. Loss, of course, comes in many guises, and the section of the book is entitled “Other Elegy”, extending from elegy for lost friends to elegies for nature and finishing with a translation of Rainer Maria Rilke’s “Requiem for a Woman Friend”. This is poetry that could draw in even those unaccustomed to poetry, accessible yet still with the density and surprises of language which makes poetry poetry.